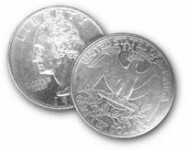 Objective: Get more quarters into a glass than your opponent in a certain amount of time. Supplies: A bunch of quarters (around 40-60), a stop watch, 2 glasses and alcohol of choice. Directions: Two people stand at the same end of a table and place two glasses down the table at a same distance. Each player is assigned a glass and gets a whole bunch of quarters (around 20-30 is a good). The timekeeper sets the stop watch for 30 seconds and tells the players to "Go". Each player tries to bounce the quarters off the table and into the glass. Whoever has the most quarters at the end of the 30 seconds wins. The loser takes the difference between quarters made and has to take that many drinks (e.g., winner made 15, loser made 10, loser takes 5 drinks).